Louis Comfort Tiffany, Tiffany Studios Lamps, & L C Tiffany Favrile Glass History & Reference Information @ Collectics! Louis Comfort Tiffany was born on January 17, 1848, the son of Charles Lewis Tiffany, and began his career as a painter in the 1860s and 1870s. His father Charles had founded the most prestigious jewelry and silver store in America Tiffany & Co., so young Louis grew up surrounded by the decorative arts. Charles Tiffany introduced the nation's first retail catalogue, and his obsession with the simple elegance of classic silver design earned Tiffany & Co. the highly coveted Award of Merit at the Paris Exposition Universelle in 1867. This was the first time an American company had been recognized by a European jury. After studying under the American landscape painter George Inness, Lewis Comfort Tiffany learned to combine the use of light, color and nature in his work. He received praise for his oils and watercolors, which included scenes from his travels in Europe and North Africa. By 1880, Tiffany had established himself as a artist and became the youngest member of the National Academy of Design. Already at this young age, Tiffany dedicated his life to "the pursuit of beauty." Tiffany’s travels not only influenced his career but also acquainted him with the designs of medieval and Roman glass. Glass would offer a new field of challenge for Tiffany, and he began experimenting with the chemistry and techniques of glassmaking at the age of 24. This would lead him to his next endeavor in design and decorative arts as an interior designer. 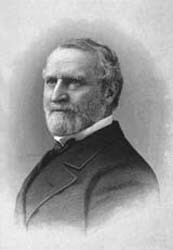 His commissions for Mark Twain, Cornelius Vanderbilt and the White House under President Chester Arthur earned him an international reputation and great success. Stained-glass windows were a feature in these interiors. While continuing to do commissions, Tiffany founded his own firm in 1885 and focused on art glass. Earlier, Louis had already registered for a patent on a new glassmaking technique of combining different colors in opalescent glass to create vibrant, multidimensional hues of color never before seen in glass. With the help of chemists, craftsmen, and glass designers, he was able to make stained glass in over 5000 different colors and textures. This challenged the traditional approach of painting on glass to create multicolored effects. Tiffany became an enthusiastic supporter of the European Art Nouveau movement, challenging the current Victorian ornate style. Art Nouveau used free-flowing designs based on nature that exemplified the characteristics prevalent in Tiffany’s earlier creations as a landscape painter. The use of light, color and nature assumed greater significance in Tiffany’s work as he developed his unique approach to Art Nouveau. Tiffany's work was displayed in Europe at the most important venue for the introduction of Art Nouveau, Siegfried Bing's L'Art Nouveau. Tiffany is best known for his designs of glass vessels, lamps and windows, but he also created items in various other media including metalwork, furniture, jewelry and ceramics, introducing enamels in 1898, art pottery in 1900, and jewelry in 1904. 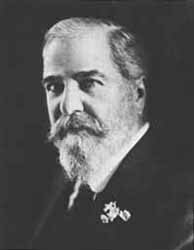 He established a metalwork department, producing lamps, desk sets, and chandeliers that were sold through his New York showroom, company catalogues and department stores. He designed most anything having to do with interior design, including even textiles and wall coverings. His remarkable career spanned over five decades, including his tenure with L.C. Tiffany & Associated Artists, the Tiffany Glass Company, Tiffany Studios, Tiffany Furnaces and the L.C. Tiffany Furnaces. By Tiffany’s death on February 18, 1933, the popularity of his elaborate lamps declined with the rise of Art Moderne and Expressionism. For two decades the designs of Louis Comfort Tiffany were forgotten. It was not until the first Tiffany retrospective show in 1958 that his objects were rediscovered by museums and collectors. Awareness of Tiffany’s craftsmanship escalated with an Art Nouveau show in 1960 at the Museum of Modern Art. Today the designs of Louis Comfort Tiffany are honored and treasured around the world, confirming Tiffany’s legacy as a visionary of Art Nouveau design. As the son of Charles Lewis Tiffany, the legendary founder of the silver and jewelry firm, Tiffany and Co., Louis chose to pursue his love of art instead of following in the family business, gaining acclaim for his oils and watercolors in the 1860s and 1870s. In the 1880s, however, he turned his attention to interior design as "a way to provide good art for American homes." His diverse career spanned 57 years. As one of America’s most influential artists, designers and craftsmen of the century, Tiffany wanted to bring decorative arts to the same status as fine arts. The lamps of Louis Comfort Tiffany signify this quest to bring beauty into the home. After collaborating to light the first movie theater, friend Thomas Edison suggested the idea of making electric fixtures. Tiffany soon began to create lamps as small versions of his exquisite stained-glass windows and developed the idea into a new art form. He first began experimenting with lamps in 1895 although they were not offered for sale in his showroom until 1899. Tiffany’s lamps, most of which were made between 1897 and 1920, were and still are recognized for their superior design and handcrafted details. In addition to bringing beauty to the masses, Tiffany also made discoveries in the process for formulating glass. Tiffany developed a unique process that created bolder colors, opalescent sheens and a broader range of textures for artisans. He patented four types of glass over a period of two decades and worked with teams of craftsmen to manufacture stained-glass windows, lamps and lamp bases. 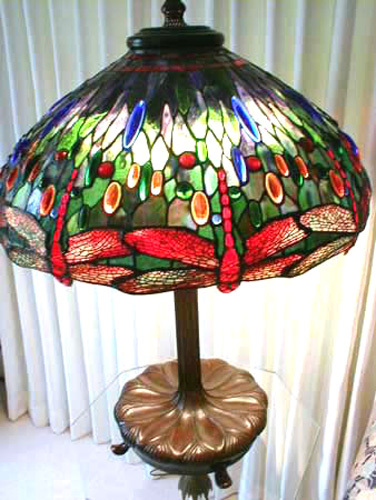 He used the leading inherent in the design of his leaded glass lamps to add to the naturalistic forms, letting it represent, for example, the stems of plants. The motifs in Tiffany’s elaborate lamps were inspired by his love of nature, and the names of his lamp designs are indicative as they include the dragonfly, dogwood, peacock, peony, daffodil, laburnum, wisteria, poppy, acorn, water lily, and more. Tiffany stated that his lamps allowed more people to enjoy the elements of nature, such as flowers in bloom, all year long in the beauty of his glass. While most Tiffany Studios incorporated bronze bases into their design, he also teamed with the Grueby Pottery to add their fine art pottery bases into early Tiffany oil lamp canister designs. In the 1930s and 1940s, Tiffany lamps were considered too ornate by modern fashion standards and lost their popular appeal. By the late 1950s, Tiffany objects were rediscovered with great interest by collectors and museums. In 1998, two Tiffany lamps made the top ten list of United States auction prices for decorative arts bringing in nearly $2 million each. Favrile Group: The term Favrile, meaning handcrafted, is associated with the first and simplest shades made by Louis Comfort Tiffany. An early patent obtained by Tiffany under the name Favrile encompassed several types of glass used in the manufacture of stained-glass windows as well as leaded and blown shades. However, the term now is associated with blown forms such as shades and other types of hollow ware. Favrile pieces are generally inscribed L.C.T. or Favrile, while shades made from leaded glass are labeled with impressed metal signature tags. Geometric Group: The term geometric is applied to the group of leaded-glass shades with the simplest designs, and includes standard geometric shapes such as squares, triangles, rectangles, ovals, ellipses, and rhomboids used on panel, cone, and globe-shaped shades. Unlike blown shades, the geometric and all ensuing groups were fabricated from pieces of poured glass cut in segments, edged with copper foil and leaded or soldered together to form a complete unit. A patinated bronze finish was then applied to the lead or solder lines. The geometric group is divided into two basic types: shades made from a large number of small glass pieces and those made from a limited number of large glass pieces, such as turtleback tiles and Favrile Fabrique panels. Transition to Flowers Group: The transition to flowers group serves as a bridge between the geometric and floral shades. It includes globe-shaped shades of basic geometric design with added botanical motifs. The group is divided into two categories: geometric shades with borders or belts of flowers and vines, and shades with scattered floral or leaf patterns on geometric backgrounds. Flowered Cone Group: Botanical patterns, which were introduced in moderation on shades in the transition group, are employed en masse in the cone group. As described by Tiffany Studios in a 1906 catalogue, cone shades are straight-sided with circular rims. They are easier to manufacture than leaded shades with curved or rounded sides, hence the greater number of shades in this category. While cone-shaped shades are found in the geometric group, they are classified there by design rather than form. Another natural motif applied to cone-shaped shades is the dragonfly. This insect design is developed further in the flowered globe and irregular lower border groups. Flowered Globe Group: The flowered globe group is more complex in construction than the preceding group of cone-shaped shades. In terms of decorative progression, their shape permits a more natural rendering of the botanical and insect motifs. 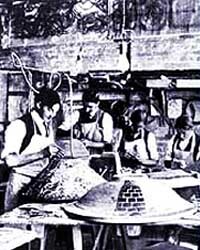 Tiffany Studios referred to this type of "domed" in its 1906 catalogue. Globes range in size from twelve inches to twenty-eight inches in diameter. Irregular Lower Border Group: The shades in this group take on a more naturalistic form, with flowing, serpentine rims. The uninterrupted metal edge and stylized band of the preceding groups have been replaced with a curvilinear lower border. Except for the panel shades used with the grape trellis motif, all the shades in this group are globular in shape. The natural termination of leaves, fruits, insect bodies, and flowers give shades in the irregular lower border group an Art Nouveau character often associated with Tiffany Studios. Irregular Upper & Lower Borders Group: At the final phase of development are shades with both irregular upper and lower borders. In this group the artificial straight edge of the aperture is replaced by an openwork crown that simulates tree branches or shrubbery. Finials have been eliminated, and light and heat are diffused through the crown. The combination of the irregular upper and lower border is, according to Egon Neustadt (author of world standard reference source Lamps of Tiffany), "the consummate Tiffany Studios Shade." At first, Tiffany used glass used by outside firms, but this did not give him total satisfaction. As his fascination with glass grew, he experimented with lustering techniques, largely inspired by the natural iridescence of ancient Roman glass. He patented his first glass-lustering technique in 1881. 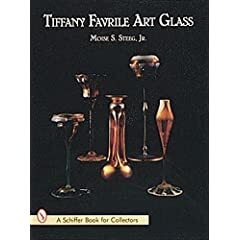 Favrile glass, the trademark for Tiffany handmade glass, resulted from these experiments and, with the exception of Tiffany lamps, it is the ware for which he is best known. Tiffany set up his own glasshouse at Corona, Long Island and put a brilliant Englishman, Arthur J. Nash, in charge. His previous companies had all been concerned with interior decoration; this one, Tiffany Furnaces, concentrated on decorative blown glassware. In 1893 Tiffany introduced his first hand blown-glass vases and bowls, which he called "Favrile." The word Favrile was taken by Tiffany from an old English word for hand made. Tiffany Favrile glass quickly gained international renown for its surface iridescence and brilliant colors. Galle, Daum, Moser and the Muller Brothers, all working in Art Nouveau, created their effects mainly on the bench by cutting, etching, and enameling glass. Even though Tiffany's very small output of cameo glass was carved, the overwhelming majority of his ware were produced entirely in the furnace, and no Tiffany glass was ever enameled. Tiffany developed a whole range of unique glassware by trying out and perfecting new techniques in the furnace. The glass itself was of the best quality, its colors achieved by the addition of metallic oxides, variable by temperature within the furnace. His lustering technique, with its iridescent effect, was the most important because it was his hallmark, used in many different wares. This involved dissolving salts of metallic oxides in the molten glass, so creating the chosen colors -- soft greens, blues, golds, etc. The metallic content was then brought to the surface by subjecting the glass to a reducing flame and spraying with another chloride. This treatment caused the surface to crackle into a profusion of tiny lines that refracted light. The skill of the blower was paramount in this, because Tiffany glass was free blown. Speed was necessary to achieve the desired effect before the molten glass cooled. With intricate Tiffany specialties, like the peacock feather motif or a jack-in-the-pulpit vase, executing this technique was very difficult. Specialty glassware is rare and therefore expensive. Lava glass, with its glorious golden trails on rough-surfaced basalt, and Cypriote glass, rolled in fragmented crumbs of glass to give the impression of old Roman glass, are examples of iridized pieces of Tiffany ware. Damascene glass is another such specialty, developed c.1910, which incorporates striped of golden luster giving the appearance of damascened steel when blown into wavy stripes. Agate glass exhibits a marbled effect resulting from a mixture of various colored glasses. Many Tiffany specialties were developed from ancient forms and styles. For example, the technique for creating millefiori had been used 2000 years ago, but not by Tiffany's methods or with his luster finish. The closely packed "thousand flowers " of millefiori, most familiar in French paperweights, were formed by fusing tiny rods of colored glass. Tiffany did not place segments of these rods in close proximity as in paperweights. Rather, in the celebrated Tiffany floral vases, a patch of opalescent glass and the whole was reheated, allowing the well-separated flowers to be molded into the body before the piece received its iridescent finish. Some items decorated in this manner were cased with a layer of clear glass, sometimes called Tiffany paperweight glass. Aquamarine glass, made in much the same way, was embedded with marine decoration and wavy green sea vegetation occasionally with fish or pebbles. In these works, the heavy green glass was intended to simulate the sea, and those with fish and sea life are the most rare. These vases produced c 1905-1915 were made according to paperweight making techniques, but what would be a flaw in a paperweight, i.e. bubbles of air, adds to the naturalistic effect as bubbles rising to the surface of the water. In 2002, a Tiffany Favrile aquamarine Goldfish vase, one of only 2 known to exist, sold for $532,000 setting a new record for Tiffany glass. Tiffany glass comes in all sorts of colors and can give the impression of having been formed by pure chance. The vast majority of his lustered wares were vases, but a few dishes and bowls were also produced. Like all worthwhile products, Tiffany glass was often faked, so that great care must be taken when buying; prices are too high for mistakes. Tiffany glassware was at its best from the late 1890s to 1918. Many of the glass forms were perfected after 1900 and were manufactured under several company names. Most of it was signed, either stamped or engraved around the pontil, with a model number and the initials "LCT," "Tiffany Studios N.Y." (responsible for most of the bronze wares), or "Louis C. Tiffany Favrile". Forged Tiffany marks are not always obvious, but fakes rarely measure up to Tiffany standards. Tiffany retired in 1918, but he kept a watchful eye on the company. Nash carried on the business, but his later work, fighting a rearguard action against Art Deco, was not of the same quality. In 1928, L.C. Tiffany severed all connection with the firm, withdrawing permission to use his name. By his vision and energy, L.C. Tiffany succeeded in blending classical motifs with bold new techniques in glassmaking to create a distinctive American art form. The demand for Tiffany glass among today's collectors attests to the lasting value of his work. 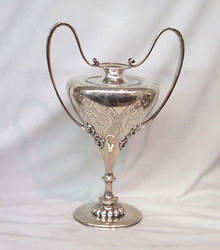 Buy period L. C. Tiffany favrile glass and Tiffany Studios lamps, bronze, silver, and tiles on the Collectics Fine Antiques and Glass & Crystal pages, or search the entire site for great antiques, collectibles, and crafts for every collector! Sell or consign Tiffany, Handel, Pairpoint, Galle, Daum Nancy, Frankart, and other top vintage lamps and glass at Collectics. Read about our top performing national consignment program for estate and personal collections.